Sabayon Linux is a very fun distribution based on Gentoo Linux. That tidbit of information may be one of the reasons Sabayon isn't more popular, although it shouldn't be. The mention of Gentoo usually invokes visions of difficulty and hours of compiling to Linux users. While that general assessment of Gentoo may be correct overall, it certainly isn't true of Sabayon. In fact, if it wasn't a known fact that Sabayon was based on Gentoo, many users might never realize it. To end users Sabayon Linux is a fully functioning, complete, and easy-to-use distribution. It ships with the latest in desktops and software with lots of tools for setup, maintainence, and configuration. In fact, it comes with lots and lots of software, including a nice selection of quality games. 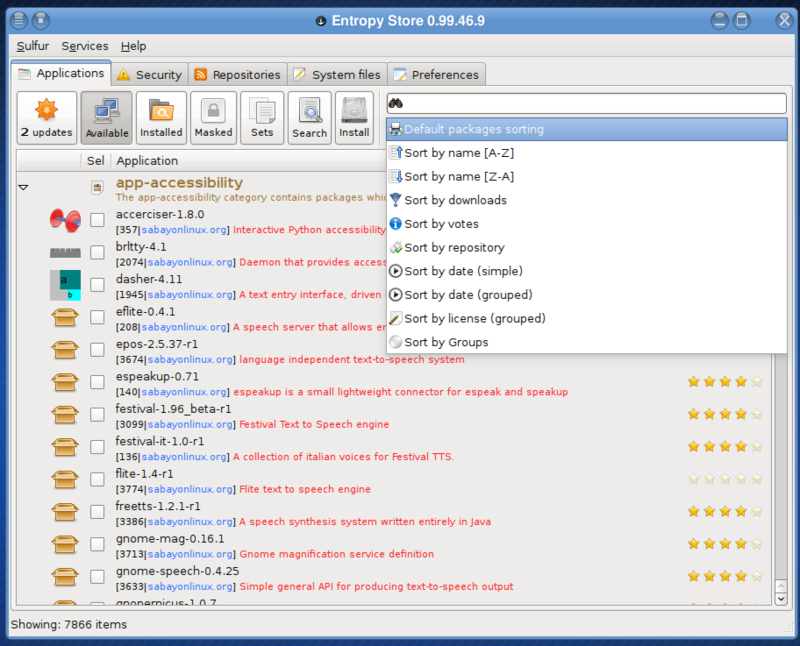 Users can choose from GNOME of KDE editions compiled for x86 or x86_64 systems. It also includes 3D acceleration and proprietary Wi-Fi drivers as well as codecs and plugins for full multimedia enjoyment. While some may underestimate the value of a nice default appearance, Sabayon 5.x has really jumped onto the right track. While earlier versions might have been "cool," today's Sabayon desktop is understated, professional, and attractive. As anyone who has ever run Gentoo knows, there is no graphical package management tool. Oh, there were some third-party offerings and a few that even worked pretty well, but Gentoo itself never had one. So this seems to have been a priority for the Sabayon project and they've constructed a respectable set of software and update management tools. Sabayon's package management system is set up to pull from their own repositories of binary packages. There's no commandline magic for anyone to learn and there's no wait for packages to compile - unless you wish. Advanced users or those with special requirements can pull from Sabayon's source repository to compile. One could even use Gentoo repos, although this isn't recommended much beyond the occasional single package or two. 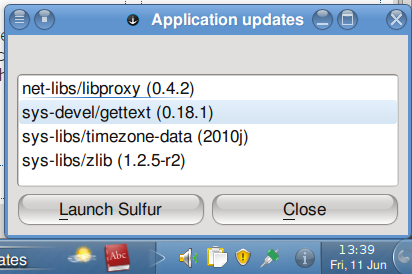 Sulfur is the graphical front-end to Entropy and Magneto is the updater. Sulfer may seem a bit clunky to those accustomed to Synaptic or Mandriva's tidy interface, but the same functionality is there and it is easy for users to adapt. Magneto runs in the background checking for updates and places an applet in the System Tray to advise users of available updates. A recent install showed 206 updates (consisting primarily of the newest KDE release) and all operations were completed smoothly and accurately. The latest release features the 2.6.34 Linux kernel, GCC 4.4, and either GNOME 2.28 or KDE 4.4.3. Ext4 is the default file system and Btrfs is supported. Sabayon ships with the latest OpenOffice.org, Firefox, and lots and lots of other software. 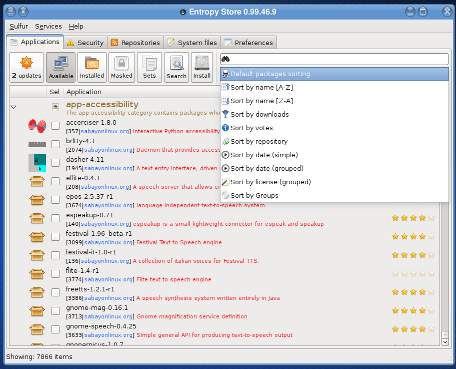 The repositories contain many more. Sabayon has used Red Hat's Anaconda installer for several releases and it does an exemplary job, but this release saw an update to a newer codebase. It walks users through an easy set up and install. One can use Sabayon's Anacoda just to reinstall Grub if necessary as well. The only glitch encountered was setting the root password. Sabayon live DVD ships with a blank root password and entering a new root password when asked by the installer doesn't transfer to the new system. This will have to be done manually after boot. Sabayon is also setup to use Sudo for those that prefer that. This release of Sabayon is proving to be easy, fast, and stable. It is available in x86 or 64-bit KDE or GNOME versions as well as a CoreCD consisting just of the basics. With the included XBMC, Sabayon can easily become a home theater center as well. It is also the only known live distribution to offer musical accompaniment during boot. All the technical aspects aside, the best thing about Sabayon is - it's just plain fun and easy to use.